Oklahoma’s Baker Mayfield, the winner of the Davey O’Brien Quarterback of the Week award during week three, took time to speak with the Davey O’Brien Foundation on Tuesday evening. 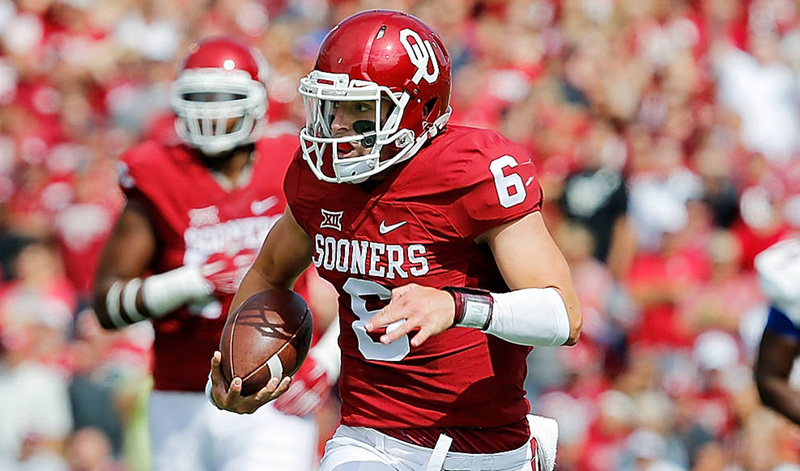 Find out more about Mayfield, who leads the nation in points responsible for (86) and ranks second in passing touchdowns (10) and total offense (400.3) in his first year at OU. Here he talks about winning the award, playing quarterback at Oklahoma and what motivates him. Q: What does winning an award attached to the name Davey O’Brien mean to you? Q: There have been two recent winners of the Davey O’Brien National Quarterback Award (Jason White and Sam Bradford). What is it like to play quarterback at Oklahoma? Q: What have the last month been like for you? Q: Your offense is averaging over 40 points per game this season. What is really clicking for the Sooners? Q: What was it like to sit out last season after transferring? Q: You were very small as a freshman in high school (5-foot-2). Did you use that as motivation to get where you are now? Q: Your dance moves have been showcased all over the internet. If you won the Davey O’Brien National Quarterback Award after the season, would you pull off a new dance?